It is with great excitement and pleasure that that we announce the opening of the on-the-EDGE Store! 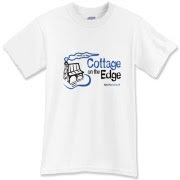 At the store you can order Cottage on the Edge clothing among other items such as coffee and beer mugs, BBQ aprons, and drink coolers. The clothing is offered in a complete range of sizes and colours, plus there are specific styles for men, women and children. Be sure to sign up for the newsletter (in the sidebar) to get alerts on any new items we add in the future and, most importantly, any discount promotions we are offering. You can get to the Store by using the menu item about or from this post by clicking here or on the T-shirt. Definitely interested in any comments and suggestions you have on our Store, please send us a note in the comments area below. We will be communicating to you to several upgrades we are doing to the website and blog, including the DIY Cottage Forum, and our new monthly newsletter.